I'm tempted by that deal, but I feel like the GBP is about to be worth a lot less. They don't do a 3 for 25 that often. Comes down to around $13 each for Disney 3-D blus. I might jump on this for the three I don't yet own. It's also good until April 28, so there may be some time for currency exchange rate changes. For those of you who haven't heard.... The only known 3D version of Ralph Breaks The Internet is having a movie NEXT version coming out in Japan, it will cost you though. From what I understood it’s just what they call their fancy packaging. I was going to pass, since I took advantage of the 2 for 18 last week ... but with the different selection and the 5 off, I pulled the trigger. Yeah all I could find as well. Might have to import, what are the chances that the 3D disc is region free though? Doesn't matter, Japan falls within our region. I thought about it until I saw it was over $50, and that’s before shipping. Would have preferred a cheaper 3D-only release as I already have the domestic 4k release. Was not aware of that. Thanks Skiizim! The Grinch is on sale for $16.99, the most recent Fantastic Beast is on sale too if you can find it or get a price adjustment. Forgot to mention, this is at Best Buy. Didn't realize Grinch received a 3D release. I'll request a price adjustment for Grindelwald 3D this week. Grindelwald is already sold out online. Ordered the Grinch very early Sunday morning and it shipped soon after. 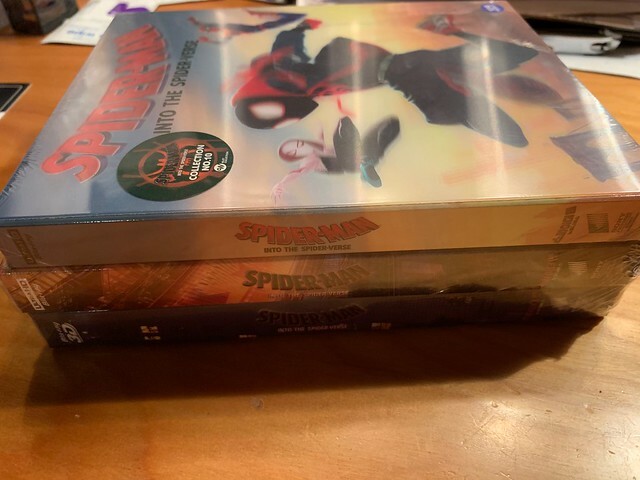 Hopefully they are still coming with slipcovers. Thanks, was able to get $7 back for FB2. Now I wish I had gotten The Grinch from BB and not Amazon! If 3-D is dead, why are they having such a hard time keeping them in stock? This sucker has been sold out since early Sunday morning. The Grinch did come with a slipcover from Best Buy (though I did order very early Sunday AM). I'm sure they made very few of them. Not hard to sell out when you do a limited run. An EBayer's paradise. They even removed the listing from their site. Truly gone forever. Thanks BB. Aquaman 3D is now $22.99 at Best Buy. Price adjustment time if you have Elite Plus. Got bonged for the 3D price adjustment because 'it is out of stock' and 'policy is it must be in stock, even on our site'. I disagree, as another statement in their policy states they will adjust if it goes lower. Hadn't had an issue in the past. I'll try again with a different representative later. It's a fair price, but not available online or within 250 miles of me for a store pickup. Bummer! As expected, I was able to get the adjustment by talking to a different representative, even though it is still out of stock. Got my One Click from Weet, can't wait to watch the 3D this weekend!